Do you have any requests for Casey to go over in next lesson that are not in the course curriculum? I believe Casey won't be painting any open mouths for his proposed busts during this morning. I believe all the busts are closed mouth busts. I do some bust with open mouths, tongues, and teeth. Perhaps, he can go over how to translucently attack the painting the open mouths. what colors (let's say it resembles an earth snake or alligator like creature)? how to paint teeth? airbrush vs handbrush? I usually handbrush my mouths but they are always opaque looking... thanks. thanks for the suggestion Stan, Ill try to work this into one of the lessons and discuss my approach to teeth and mouth areas. My sculpt does have some exposed teeth, I have a plague wolf painted by casey with some very nice dark veining in the teeth, was curious if he could elaborate on how he would go about doing something similar on our smaller scale busts? I assume just with a fine paintbrush but am curious if anything else is involved? I can talk about how I would go about painting African American skin but I wont be demonstrating that on this course. Ill try to go over it if I can squeeze it in for ya, as there is already a ton of stuff to cover coming up. Ill be talking about painting teeth and gums in the third class and a small demo in the third class. will the you tube video of the first class be available before the first assignment is due? 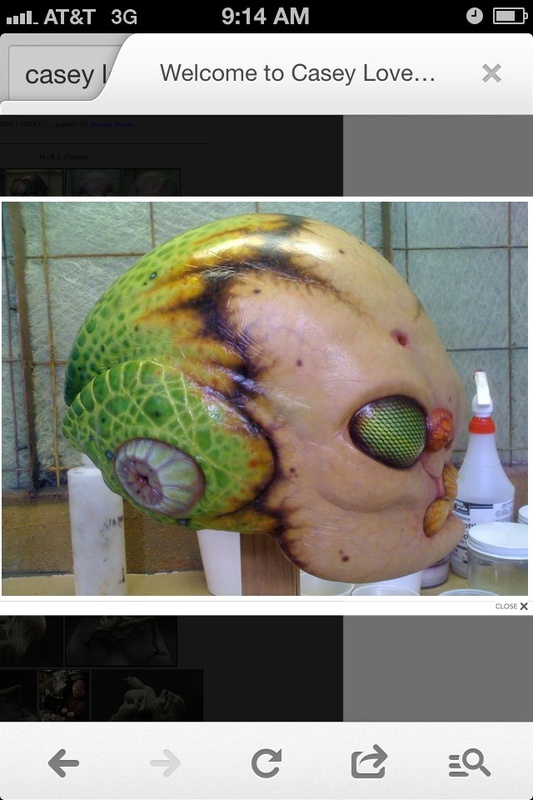 Casey - any chance we can get some photos of the green/black alien bust in here? I'd love a better look at it! HELP. I tried everything. Cant get the water out of my line. Working on my vein and it splatters. 1) Do you have a moisture trap on the compressor? 2) Does the compressor have a tank? 3) Do you live in a very damp climate? There are several possible solutions -- but they all depend on answers to those questions. @ Marc -- yours is likely a combination of recent rains and a tankless compressor. You can fix this with an in-line moisture trap, and improve it further with a tanked compressor. Tankless compressors are always more prone to moisture buildup. I have a moisture trap. I forgot the compressor was on and went to the doctors. When I got the trap was a quarter full. I push the button and took most out. I even took the airbrush off the line and push the moisture out that way. Still same problem. would love to keep in contact with everyone via face book. Im easy, No one has my name. You guys are harder. Friend request me. thanks. @ Marc -- oh, yes, airbrushing that long is guaranteed to give you moisture control issues if you're not totally geared to control it. @ Anthony -- same questions to you on the moisture issue. If you have a smaller compressor that has no tank, it can heat up over time and cause condensation to build up and then it will start to get water in the line and there really is nothing you can do about this problem. Small compressors are just not designed to be work horses. Even a moisture trap won't stop all of it. You can stop painting and let your compressor cool down a bit and then go back--yes a real pain but thats about all you can do until you get a bigger better compressor. I would recommend for $199 through www.coastairbrush.com they sell one called California air tools, has a tank on it and is a really quit and good work horse. Make sure it has a moisture trap at the compressor as that is most important. You might also want to include a hookup to get two airbrushes going at one time, can always be added later but if your going to get into airbrushing heavily then a good compressor is a good investment. Ill take and go over questions tomorrow--see you all then! can you start with a stencil to establish giraffe pattern effect? Anthony, I haven't seen one for a giraffe pattern -- but there are a LOT of hex, circle, and similar pattern sheets out there. Of course I suspect that Casey is going to say, "Yes, but you're better off learning how to do it with your brush." Stencils are like texture stamps in sculpting---you can tell when one has been used, they end up looking to repetitive but sometimes you get lucky with one. I have personally never had any success with them. 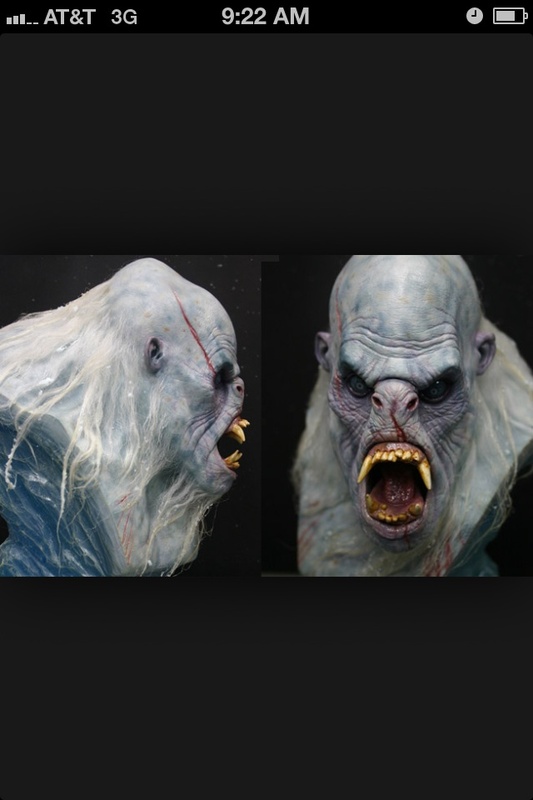 3 how do you get the wet iced look to the hair on your Yeti bust? I remember you mention that there is a way to sell the dark on the back of my alien. You said something like pearlescent. thought I mention I picked up the book, The smaller majority (hard cover) for less than 9.00. Nice price, where? I just got a copy of that book Frog, it is insane, so inspirational for patterns and colors, can't wait to crank out some sculpts to works these ideas into, incredible book !!! Casey, in the beginning of the 3rd class, you mention that you might go over the texturing that you did on the forehead of the latex pc that you were working on. Can you explain it? Also would I be able to apply the techniques that I learn in the class to a foam latex appliance ( of course I would have to use prosaide first) ? is the last creature you showed in class made out of smooth on flex foam it 17. If so someone told me that the only way to paint it is with tulip fabric paint. If it is run in the flex foam and you used the fw inks then I can return the fabric paint and invest more of my $$$ in the inks. Please let me know. thanks. can you list the colors you used for the eyes. I believe it was 7 colors.